Lenore Sobota is an ACA Level 2 kayak instructor who has taught at symposiums on Lake Superior, Lake Michigan and Lake Huron. She is also the ACA state director for Illinois. 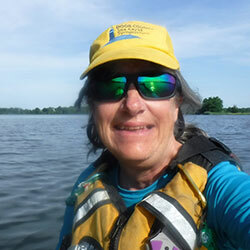 Sherri Mertz is an ACA coastal kayak river kayak, river and touring canoe and SUP instructor. She is also one of the people who launched PaddleSafely.com to foster safe kayaking on the Great Lakes. The year 2018 was deadly on the Great Lakes. Not all of the record-number of drownings were paddling-related. However, the deaths of a father and three children while kayaking in the Apostle Islands rightfully attracted a lot of attention. The Great Lakes come with Great Responsibilities. Join a panel discussion about our responsibility to be properly prepared and our responsibility to educate others. Learn more about paddling deaths, efforts to prevent them and what it takes to take on the Great Lakes. Be prepared to offer your own suggestions too.